Life in this hectic and bustling era often means that we're constantly searching to improve our lives. We reside in small dwellings, and more often than not, we also spend our time in compact offices as well. Due to the lack of space, and the rising cost of property, many people and designers are starting to look beyond typical, mediocre and commonplace houses, and focus on innovation and creativity. These qualities are what bring us to today’s feature residence, which has taken an everyday, rather undistinguished item and reconfigured it into a brilliantly engaging abode. Planned and conceived by German designer Stefan Brandt, this intriguing dwelling incorporates a shipping container as its main shell, adding solar panels to increase sustainability. If you would like to take a peek inside and check out the interior of this unique home, then continue reading to peruse the images below! Known as the Pocket Container, Stefan Brandt has created a range of flexible container homes to suit every possibly requirement and necessity. Available in different lines, including the standard, office, senior, junior and holiday, there is practically something to fit even the most demanding of homebuilders. Modular in its design, each shipping container is made to suit a different purpose, with the aim of combining certain rooms to create a complete dwelling. 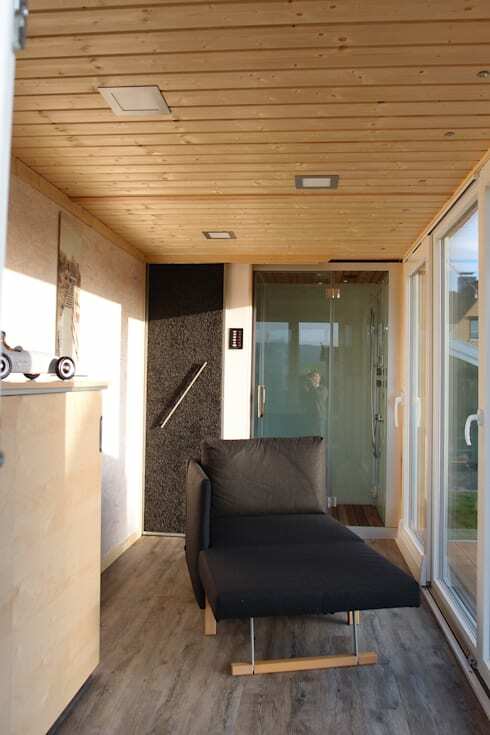 To give you an idea of the size of this micro home, the standard container is 13 square metres, with a 6 square metre terrace attached. Finally, we can also see the solar panels that sit either side of the opening to the interior. These are perfect for boosting the sustainability of the house, while increasing its green, eco-friendly attitude. In this image we see the rigidity of the structure, with its shipping container exterior offering a bold and dramatic departure from tradition. 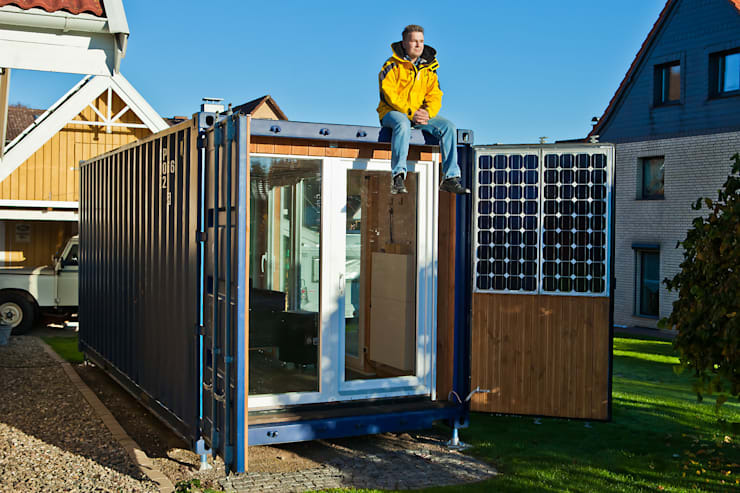 Due to the changeable aspects of the shipping container’s shape, the cube-like form is highly adaptable, and can be altered to suit many different requirements. Committed to making the Pocket Container micro home more liveable and attractive, a large timber deck is added to the exterior. This ensures that although the interior is compact and often lacking in square metre space to live, there also exists the outdoor entertaining area, perfect for hosting guests or reading a book in the sun. 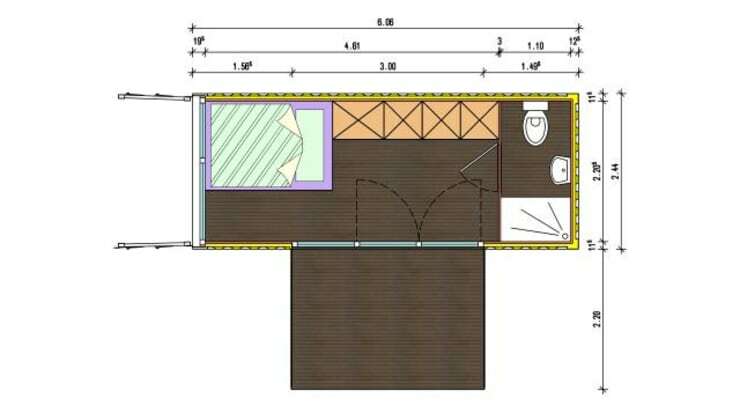 To give you a better idea of the actual layout of the micro home, we take a peek at the floor plan. Set up in this instance as sleeping quarters to fit a bed and en suite bathroom, the room is compact, yet still comfortable. Ideal for those individuals who reside alone or perhaps those who wish to build an inexpensive holiday dwelling, this cabin-esque setup is cosy and comfy. Often, looking at floor plans obscures our vision of what the actual abode may look like from within. In this next picture we are seriously surprised by the comfortable and inviting aesthetic that has been created. With more than enough space to move around inside, this room utilises timber tones to add an additional cosiness and ambience of warmth. At the end of the room we see the shower space and additional toilet, amazingly unrecognisable as its original shipping container form. To really add that sense of homeliness and remove any shipping container connotations, the designers have utilised a large volume of glazing and textures. This next image focuses heavily on the ceiling, which we see has a wonderful timber cladding. Adding a chalet feeling and atmosphere within the room, the timber is paired with large windows that bring in copious volumes of natural illumination. 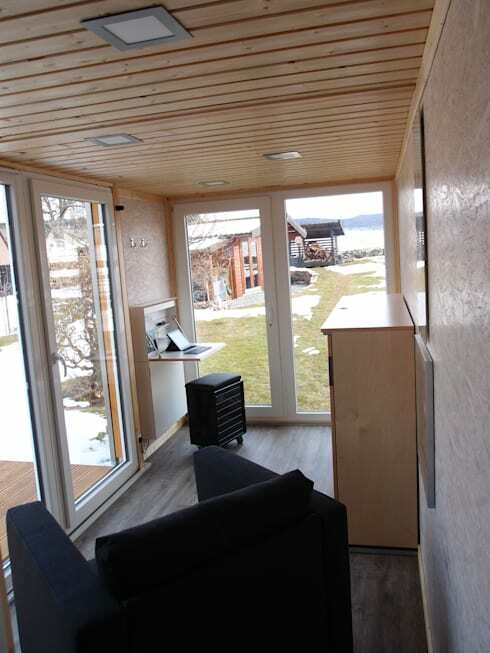 As a final note, we can see that the micro home has worked carefully with furniture choices and employs a foldable desk to both save space, as well as offer an essential workspace, which overlooks the scene outdoors. Did you like touring this property? Check out more here: 7 amazing prefab homes to inspire you and continue reading! 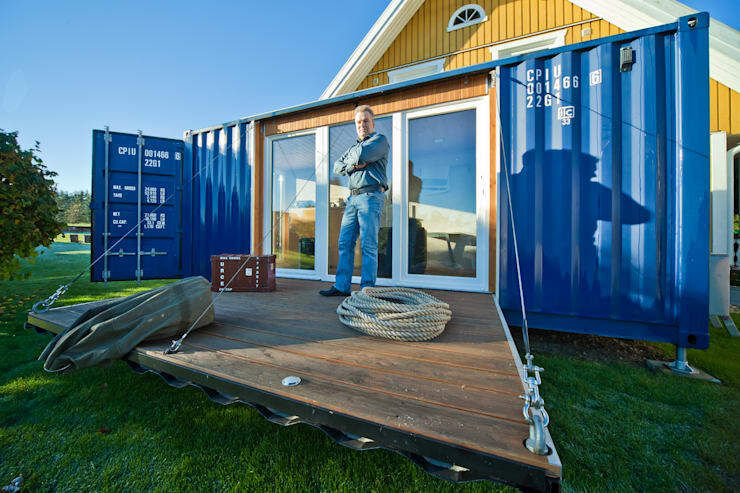 Would you live in a shipping container home? Let us know below!